2. Fill the combustion chamber approximately half-full with lightly packed wood. If the combustion chamber is completely full the performance will be poor. Place some easily combustible material under the combustion chamber such as a crumbled up piece of paper or some dry grass. Insert the blow-tube into the hole on the side of the stove. 3. Ignite the material under the stove. In a few minutes there will be a steady fire burning in the combustion chamber. The process can be sped up by blowing gently into the blow-tube. If the wood in the chamber is wet it will take a few minutes more before a steady fire is reached. 4. Once the fire is steady, blow air through the blow-tube to increase the intensity of the fire. 5. Once the fire has reached a high intensity it can sustain itself with the top covered. This means that the stove is ready for being cooked on. Place your pot on top of the stove and start cooking. No need to carry fuel. TrailStove runs on wood, wood is all around you, everywhere you go. Never runs out of fuel. you going to do? Drill a hole in the ground and hope to strike gas? get your stove started. What are you going to do? capacity even after very serious physical abuse. TrailStove to get things started. turn your propane stove useless when you go out of the country. And you're not allowed to bring propane with you on the plane. earth where TrailStove cannot easily be used. leak could not only ruin your trip but end your life. 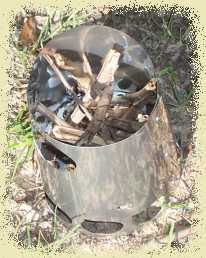 TrailStove uses no toxic or explosive chemicals, just wood. Simply the most clever, most simple yet ingenious product I've purchased yet. BRAVO! Just a note to say thanks for the fast service and a product that does what it claims. Got my new stove yesterday, just had to try it out. Two handfulls of twigs from my front yard and ten minutes later I boiled a cup of water. Awesome invention. Wish I had thought of it. I guess sometimes simple things are the best. Can't wait to go camping after the holidays and give my stove a real work out. I received my Stratus Stove last week, and have been using it since. It's great! It's pretty close to what I have been always wanting. Have used the stove three times now. No problems. I have a small heavy duty nylon striff sack that I keep the stove in and this fits fine in my saddlebag on my bike. For sheer simplicity and ease of use the stove is very good. I have already tried out my new stove and boiled my first cup of hot chocolate. Worked great! It's a neat stove and my son loves it. I am delighted with it and all I used to fuel it was some dry bits of a Honeysuckle bush. I love the design of this stove as well as the simplicity. You are one of a surprising number of folks I've done business with on the web who have given me "astounding customer service". Keep up the good work. I bought one from you several months ago and was impressed. It's really nice, thanks a lot, very clever design. This is awesome! It is an excellent idea! Genius! Incredibly genius! Back-to-basics wins again. I just wanted to tell you how much I have enjoyed your stove. I have used it for 2 week long and 5 weekend trips so far. This is now my stove of choice for all backpacking. It is by far the best stove I have ever used. To be able to cook as much as I want and not constantly worry about fuel comsumption is wonderful. Thank you for a terrific stove. 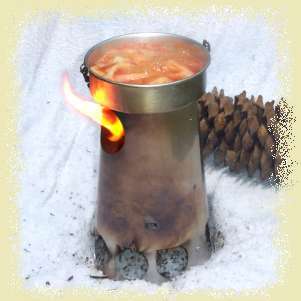 Do I have to blow into the blowhose all the time while I'm using the Trailstove? Of course not! A few puffs during the ignition stage and maybe a puff to get a quick boost in power output during cooking. Just like bellows for a fire place. If you spend a lot of time blowing into the hose, you are probably doing something wrong such as putting too much fire wood into the stove, the stove performs best when it's about half full of wood. Can I buy the Trailstove in stores? Not at the moment, but we are planning to have it in stores soon, please check back. Can I order by mail instead of online? Do you have a reseller in Europe? Yes, if you are ordering from Europe you can also order from Qvist Outdoor Cooking , located in the Netherlands to save on shipping, cut down on delivery time, and avoid possible customs fees. Depends on where you are and how many stoves you buy. You can enter your order into our shopping cart , the total charge including shipping will be shown to you before you enter any credit card information. Delivery time within the United States is normally about a week depending on where you are. International orders sometimes get stuck in customs for a few days. How can I speed up cooking time? If cooking time is too slow you are probably putting too much wood in the stove. It's a very common mistake to assume that more wood equals more fire, but oxygen is an equally important factor. If you are using thick chunks of wood it is good to fill the chamber about half way up. But if you are using thin twigs there tends to be more air between them and you can go ahead and fill it almost all the way up. Can I use wet wood? Yes, but it will take a little bit longer to get started depending on how wet the wood is. Can I use charcoals instead of wood? Can I add wood while the fire is still burning? Yes, you can add more fuel through the exhaust hole at anytime so you can keep cooking for as long as you want. What is the Trailstove made of ? 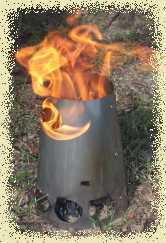 The Trailstove is made of heat resistant stainless steel. Why is the blow-tube arrangement different on the current model than earlier models? The old models had a blow-tube that was inserted into a support nozzle on the side of the stove, the function of the support nozzle was to keep the tube from going too far into the stove, just far enough to deliver the needed oxygen, the tube stayed in place until it was removed by the user. This led to the possibility of accidentally leaving the tube in too long causing the hose to melt. In the current design the blow-tube has a wide section to keep it from going too far into the stove, eliminating the need for the support nozzle. When the blow-tube is left unattended it automatically falls out of the stove eliminating the risk of a molten hose. The new arrangement is also a bit lighter than the old one. I placed an online order but I never received a confirmation? Our credit card processor automatically generates a confirmation email that is sent out almost instantly after you have entered your credit card info. However spam filtering software often incorrectly interprets these emails as spam, so if you use spam filtering you might not receive your confirmation email. If you're not sure if we've received your order please contact us and we'll let you know. What are the little "H" shaped holes for? The tongues of the "H" shaped holes are folded in to prevent the screen from accidentally tipping if you are using the optional alcohol burner. If you're not using the alcohol burner you can just ignore those holes. In winter, how can I keep the stove from sinking into deep snow? The bottom of the stove doesn't get hot enough to ignite anything easily since the cold air gets sucked in that way and doesn't get hot until it's inside the stove so you can go ahead and lay a couple of long sticks on the snow under the stove for support if needed. If you have any questions that are not answered above, please fill out our contact form. The Trailstove is covered by a life time guarantee, if anything ever goes wrong with it just return it to us and we will repair it or replace it for free. You can return an unused stove to us for any reason for a full refund within one month of receiving it.